Pit Barrel Cooker Reviews – Is This Really The Best? 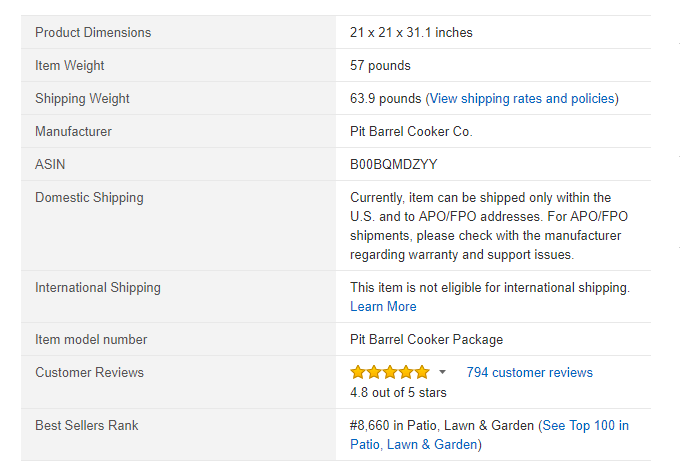 >> Pit Barrel Cooker Reviews – Is This Really The Best? Do you crave for scrumptious, smoked ribs? If yes, then you need a smoker at home because going to restaurants to enjoy your favorite ribs won’t be a good idea all the time. Well, you don’t have to go to your favorite restaurant when there is an excellent smoker available on the market by the name of Classic Pit Barrel Cooker. Haven’t heard of this product before? Well, no need to worry, you will have all the information you require after going through Pit Barrel cooker reviews. This particular cooker is among the best charcoal smokers on the market today, and the reason behind its immense success is the inclusion of a number of desirable features that we will be discussing in Pit Barrel cooker reviews. Steven Raichlen, a passionate food writer, and a TV host have placed this product on his list of top charcoal smokers. Classic Pit Barrel Cooker is a product by Pit Barrel Cooker Co. The product weighs around 57 lbs and is made of stainless steel. The color of the cooker is black, which gives this cooker a beautiful look. You are going to get a 30-gallon steel drum, one charcoal basket, two hanging rods, eight stainless steel hooks, 1-3 point barrel stand, wooden hook remover and standard grill grate. This cooker is going to last for a long-long time because it is made of durable steel and has a coating of porcelain enamel. With this coating, this cooker becomes eligible to work smoothly in any weather condition. Moreover, you can get a cover for the machine in order to further prolong its life. If you cook food in a normal cooker, then you will have to undergo an annoying process until the food is fully cooked. When it comes to Pit Barrel Cooker, you can cook at a steady temperature, i.e., 250-300 degrees Fahrenheit, which in my opinion is ideal for most dishes. Apart from that, there are a number of other features that make this machine a popular choice for starters or those who don’t have any time to barbeque. Easy setup: Technically, you don’t need to set up anything, as you will get the product in an assembled form, so you just need to take out the machine from the box and start cooking. Set it and forget it: The cooker will maintain the temperature range for about 8-12 hours, and you don’t have to add any additional charcoal. In simple terms, you don’t have to babysit your dishes. No need to refill water pans constantly: Unlike other smokers, you don’t have to fill and refill the water pan multiple times when using this smoker, as the barrel of the cooker will create the moisture itself, so there is no need to watch out for the water level. Adjust the airflow easily: The company has made all the calculations as to how much air hole needs to be left open. So, you just need to follow the company’s calculations and adjust the steel plate that is placed over the air vent. Where normal cookers will not hold more than a couple of rib racks at one time, this cooker will accommodate 8 racks of ribs along with 2-3 pork shoulders or butts or briskets. There are Turkey hangers given along with the cooker, which can easily handle a couple of birds having the weight of around 15 lbs each. Different meats are cooked at different temperatures, which is controlled by the steel grill grate. It doesn’t act as a normal grill, but it makes use of the added temperature control along with the cooker’s depth. In case you are searing a piece of steak, then you need to remove the lid in order to allow more heat to come into play. If grilling burgers, fish or pizzas, then you can just keep the lid on, so that the smoke can be produced, which is going to give more depth to these dishes. Pit Barrel Cooker epitomizes how vertical cooking should be done because you don’t have to constantly make an adjustment to the meat that is exposed to the direct heat when cooked on the hook. Here, the meat is exposed to convection heat, as a result of which, the meat is cooked evenly and with consistent taste. Pit Barrel Cooker is a portable smoker that you can carry by placing it at the back of your SUV. You can take it along on camping trips, fishing or hunting trips. No need to assemble this smoker. Just take the packaging off and start the cooking process. Cooks meat evenly and infuses with natural smoky flavor. The presence of steel grill grate provides multiple grilling options. This smoker has a large cooking capacity, i.e., 8 ribs simultaneously. Moreover, you can also hang big birds such as Turkeys having the weight of 15 lbs each approximately. The smoker is made of high-grade steel, and on top of it, there is a coating of porcelain enamel that allows this smoker to work efficiently during extreme weather conditions as well. This smoker is very durable, so you can load it onto the back of your vehicle and enjoy smoked food on trips. You don’t get much control over the cooker in terms of temperature as this smoker operates at a steady temperature of about 300 degrees Fahrenheit. The machine uses the charcoal that has good consistency, plus it needs more coal in order to maintain a specific temperature for a long duration. This cooker comes with a user manual, which customers should go through before using the cooker. Don’t place the cooker on flammable surfaces like dry grass or wood, and add only lighter fluid on hot coals. Pit Barrel Cooker is a bang for buck product because it stands out on all the important parameters. This product is durable, easy to use, packed with advanced technology and portable. I have tried my best to enlighten you about the product through Pit Barrel Cooker reviews. The final decision is up to you because ultimately you are the one who is looking for a smoker that could satisfy your desire to have scrumptious ribs, briskets, burgers, pizzas and so many other dishes in the comfort of your house. You won’t get a better smoker at a price range in which the company is selling this amazing smoker.